Note: A volcano with the same name exists in Sumatra. Gunung Sumbing dominates the landscape between Yogyakarta and Dieng plateau in central Java. The summit contains an 800 m wide crater breached to NE with a lava flow 2400 m elevation. 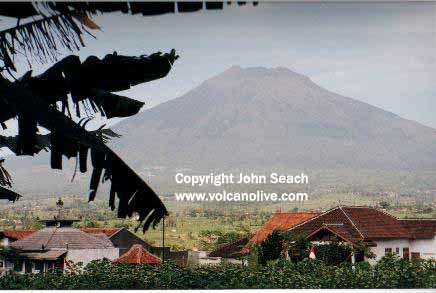 Gunung Sumbing dominates the landscape in central Java between Yogyakarta and Dieng plateau. At the northern base of the volcano is Pentarangan parasitic cone (1292 m). Namu parasitic cone (1033 m) is located on SW base. A pilot reported an eruption plume from Sumbing volcano in August 2008 and reported to Darwin Volcanic Ash Advisory Centre. No confirmation was received from Indonesia volcanologists. Reports from pilots are often unreliable, because eruption plumes may drift from the source before being observed from aircraft.